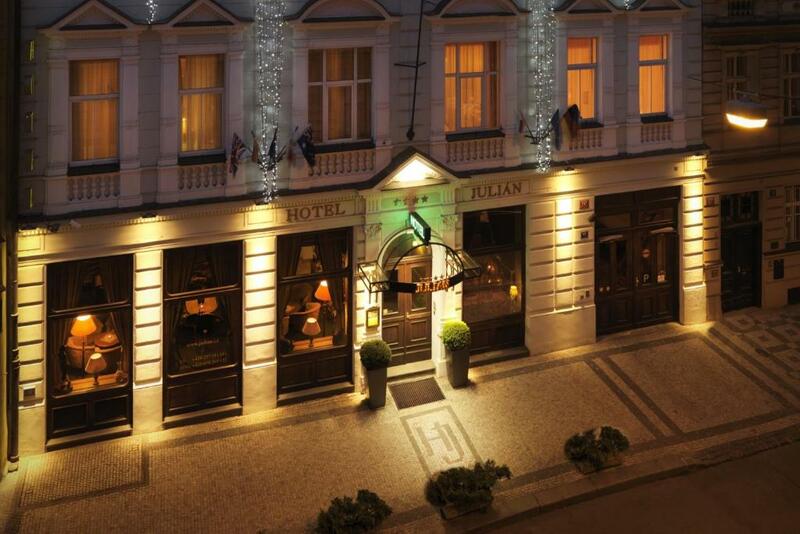 Lock in a great price for Hotel Julian – rated 9.2 by recent guests! 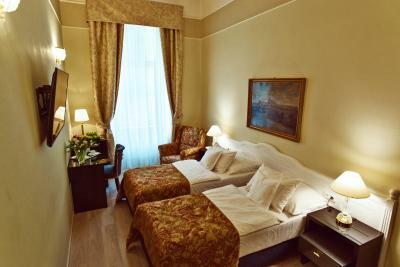 The room was spotless and the perfect size for two. Bed was extra comfy. Location is perfect for being in the heart of the lower town. You walk a few blocks in any direction and you run into something awesome to explore. Staff was super friendly and helpful to a couple of newcomers to the city. The staff was the absolute best! We were greeted with a welcome beverage and orientation. They even recommended and arranged a city tour for us. The breakfast buffet was excellent. The water pressure and temperature in the shower was great. 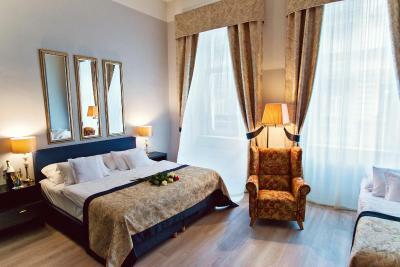 Location is good, tram station is in 1 min and there are many trams to and from city center. Also if you love walking, you can reach city center is 20 minutes or less. Good breakfast. There was really quite in the room: we don't hear neither neighbors nor noise from outside. Roomy, clean accommodations. Excellent and expansive breakfast choices. Beautiful views from rooftop terrace. Exceptionally helpful and friendly front desk staff that provided sightseeing suggestions and transportation help and tickets for Metro. We left early on our last day and in addition to arranging our transportation to the airport, they provided us with breakfast and lunch for the trip. Great choice! The breakfast was great! Such a lovely selection to wake up to every morning. The lit fires in the reception too created a great atmosphere and were very nice to come home to after a day of walking around the city. 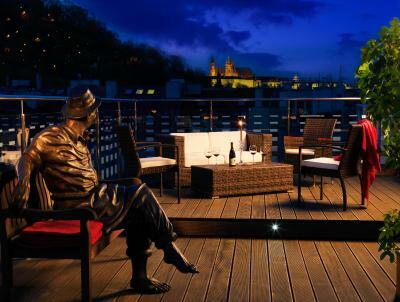 The location was 15mins walking distance to Charles Bridge. 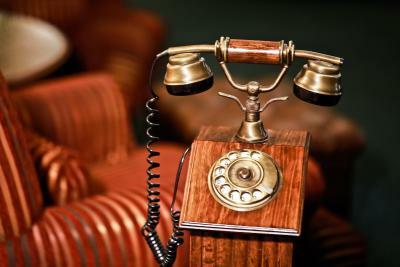 The staff were friendly, helpful and professional. Breakfast was excellent, as well as dinner downstairs the evening we arrived! Hotel Julian This rating is a reflection of how the property compares to the industry standard when it comes to price, facilities and services available. It's based on a self-evaluation by the property. Use this rating to help choose your stay! 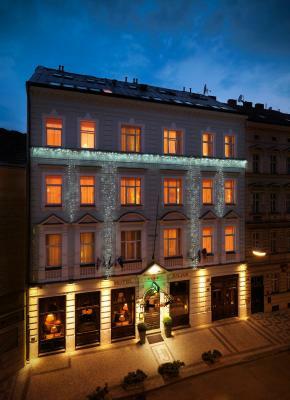 A 15-minute walk from Charles Bridge, Hotel Julian occupies a neo-classical building in Prague’s Lesser Town. 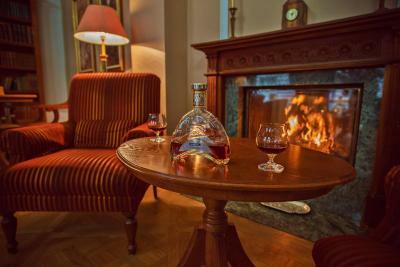 The family-run hotel features a secure car park in the courtyard, a restaurant with a summer terrace, a lobby bar with open fireplace and a wellness area. 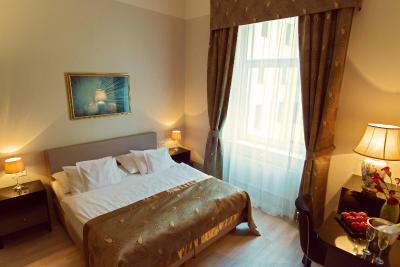 Free Wi-Fi is available in all rooms and public areas, there is also a computer with internet access in the lobby. 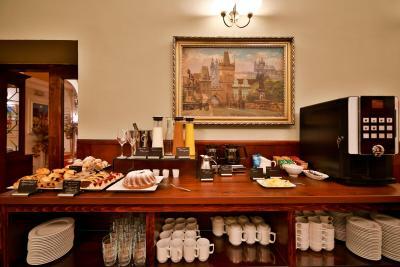 The modern air-conditioned rooms all feature a mini-bar, a bathroom with hairdryer and toiletries, satellite TV, and free tea/coffee-making facilities. 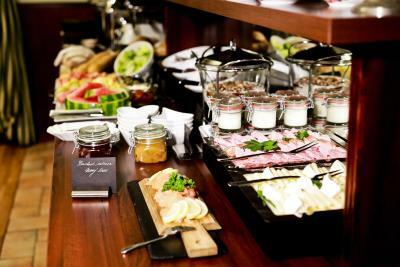 A rich breakfast buffet is served each morning. 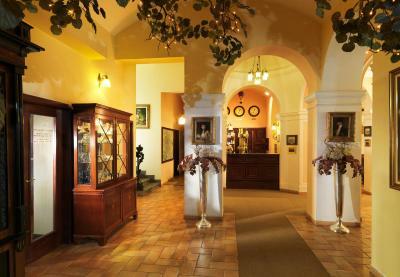 The hotel restaurant Golden Times serves Czech cuisine. Drinks are available in the lobby bar and on the rooftop terrace. 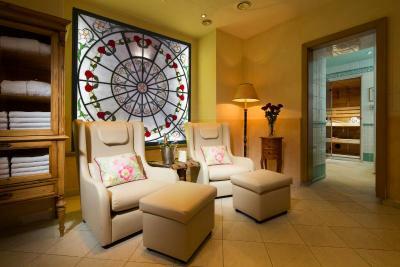 The wellness area features a sauna and a hot tub, both available for a surcharge. Massages can be also arranged. The Svandovo divadlo tram stop is only a few steps away and provides direct connections to the center. The shopping and business complex Andel City is a short walk away and features 2 multiplex cinemas and Prague’s largest shopping center. 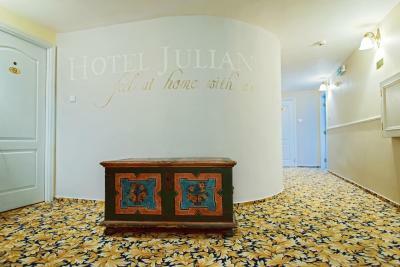 When would you like to stay at Hotel Julian? This room comes with free Wi-Fi, coffee and tea-making facilities, an LCD satellite TV, a cushion set, blackout curtains and a minibar. This single room with private bathroom comes with free Wi-Fi, coffee and tea-making facilities, an LCD satellite TV, a cushion set, blackout curtains and a minibar. This air-conditioned room comes with free Wi-Fi, coffee and tea-making facilities, an LCD satellite TV, a cushion set, blackout curtains and a minibar. Free parking for the entire length of stay is provided. This suite has a mini-bar, air conditioning and electric kettle. This suite features a sofa, mini-bar and air conditioning. 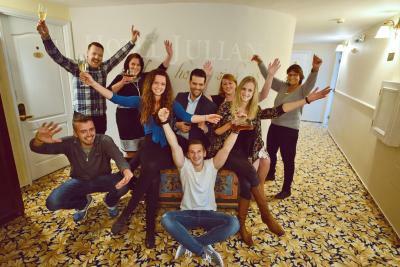 Hotel Julian team prides itself on a personal approach. 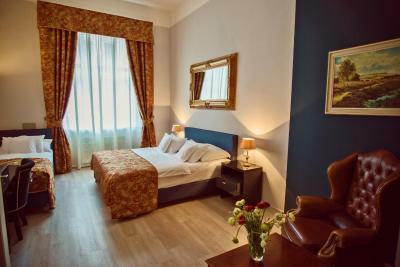 We wish to make our guests feel at home with us, enjoy comfortable and clean rooms, breakfast from quality ingredients and excellent cuisine in the hotel restaurant Golden Times. 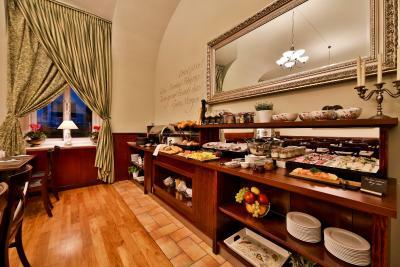 Taste our award winning "Czech dumplings" (traditional czech side-dish) and other specialities from our chef Veronika. Hotel surroundings – This neighborhood is a great choice for travelers interested in monuments, food and atmosphere – Check location Excellent location – show map Guests loved walking around the neighborhood! House Rules Hotel Julian takes special requests – add in the next step! 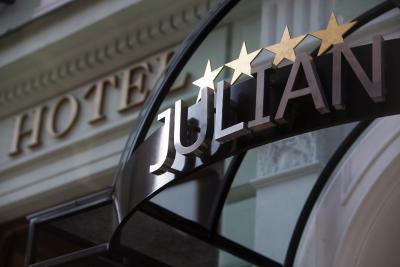 Hotel Julian accepts these cards and reserves the right to temporarily hold an amount prior to arrival. Please note that extra beds need to be confirmed during booking. Please note that parking spaces are limited. If you are arriving by car, please contact the property for more information. The people on reception were very helpful - helped find out about a bike tour for us and showed us where the metro stop was. 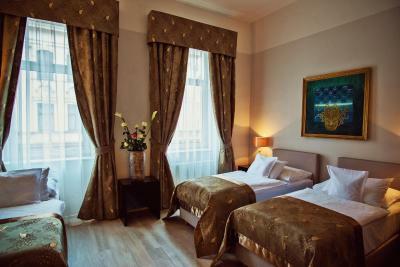 The room was very comfortable and the staff were service was excellent. 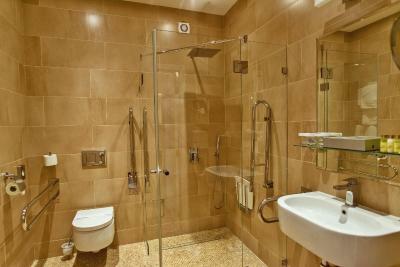 Everything about the property exceeded expectations! From the minute we arrived until the minute we left. Upon arrival, one of the ladies from reception sat with us and went through some highlights of Prague and showed us on a map where would be good for us to go and what would be great to see. We had dinner in the restaurant that night and it was delicious. 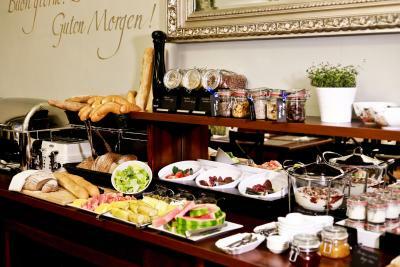 The breakfast was excellent, something for everyone! 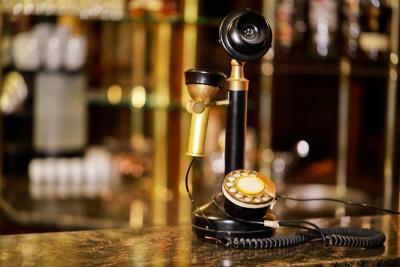 Great location (not in the thick of things, but within easy distance, and therefore quieter and nicer - plus some nice local bars & restaurants), good mix of old and new, very helpful staff (for whom nothing was too much trouble). It may not be modern enough for some younger people, but it was lovely and comfortable and worked well - the roof terrace was a lovely bonus on a sunny day. Room a little smaller than would be usual, but not an issue. Constructive criticism rather than what we didn't like. Breakfast good selection, would be good to have warm tomatoes, mushrooms or fried bread. In the bedroom it would be good to have 2 chairs to relax in rather than the one. Maybe a non slip bath mat in the bath for safety or extra grab rail. We used the restaurant 2 evenings during our stay. We felt the menu was rather limited & did not cater for every palette. Both evenings we were informed the schnitzel was unavailable and salad selection also not available on second evening. The waiter was pleasant but when I asked if I could have gnocchi instead of the dumpling with the goulash he stated that it might be a problem, I asked him to ask the chef who did accommodate me. Also when settling the bill, the waiter stated we needed to by pay cash only.it would be nice to have the option of paying by card. 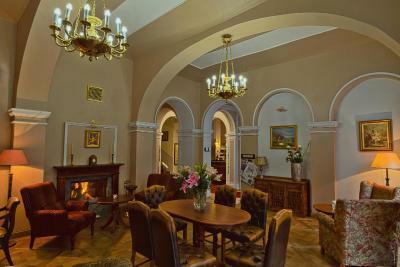 Loved the charm & interior of the hotel. Lovely welcome with bonus prosecco & beer on arrival. Staff friendly & polite. Location excellent. Lovely roof top terrace. 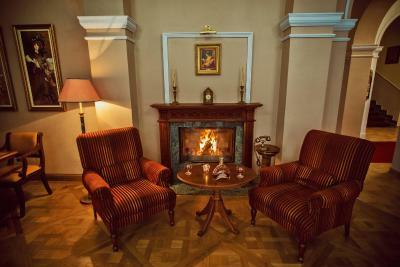 Comfortable chairs in the foyer next to the warm log fire in the evening.